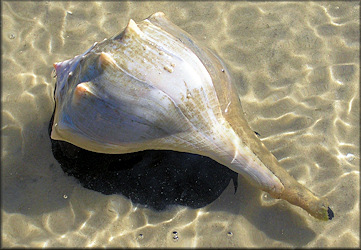 Four species of whelks can be found in northeast Florida. These include Busycon carica (Gmelin, 1791) [Knobbed Whelk], Busycon perversum (Linnaeus, 1758) [Lightning Whelk], Busycotypus canaliculatus (Linnaeus, 1758) [Channeled Whelk], and Busycotypus spiratus (Lamarck, 1816) [Pear Whelk]. Of the four, the Lightning Whelk is by far the most common while the Pear Whelk is uncommon to rare. All four can be found living intertidally on the open Atlantic Beaches as well as in more sheltered habitats such as inlets and sounds. In the case of the Channeled and Pear Whelks, the old saying "When you've seen one you've seen them all" is appropriate for both species. As a rule neither species varies much in shape and coloration and the shell you find on the beach will look like the picture in your favorite shell book. However, for a reason not yet explained, the Channeled Whelk will periodically produce a pure white shell even though the coloration of the animal and its operculum is indistinguishable from one which produced a normal shell. Most shell collectors (as well as this web site) call these specimens "albinos." Personal observations since 1998 suggest that about 13% of the sub-adult Channeled Whelks on Duval County beaches have pure white shells. The species is usually not found in sufficiently large numbers to perform meaningful scientific studies. However on 9/23/2000, five of 38 specimens found and examined at Mayport Naval Station Beach in Duval County had pure white shells. [See Image] Subsequent finds/observations over the ensuing five years seem to confirm that approximate ratio.